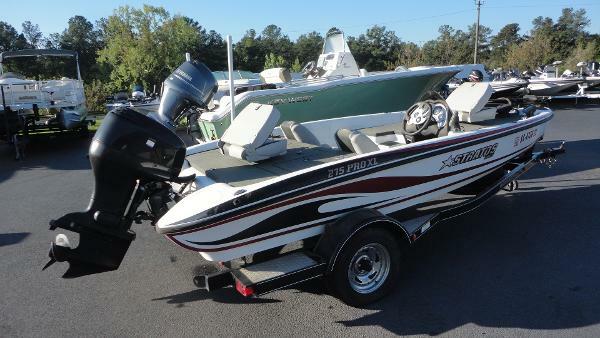 2005 Stratos 275 Pro XL - ONLY $8,900 - Pre-owned 2005 Stratos 275 Pro XL w/ Johnson J90GLSOB Oil Injected 2-Stroke Outboard - Stock Number #75263 - Red/White/Black - Imagine a fully-rigged, performance-driven Stratos tournament bass boat at a price lower than most stripped-down entry level fiberglass boat packages, even many aluminum bass rigs! This pre-owned Stratos 275 Pro XL package is unquestionably todays best bass boating value, a wood-free, all-composite boat that is totally complete and ready for competition for under $9,000. The amazing list of standard features includes a huge 93-inch beam for unmatched interior room and stability, Lowrance X47 graph at console, Lowrance X125 graph on bow, powerful Motor Guide Edge 70 trolling motor, Dual Pro battery charger, spare tire, and even chrome wheels on the matching drive-on trailer! Compare the quality, features, performance and price,and you will join the Stratos team! 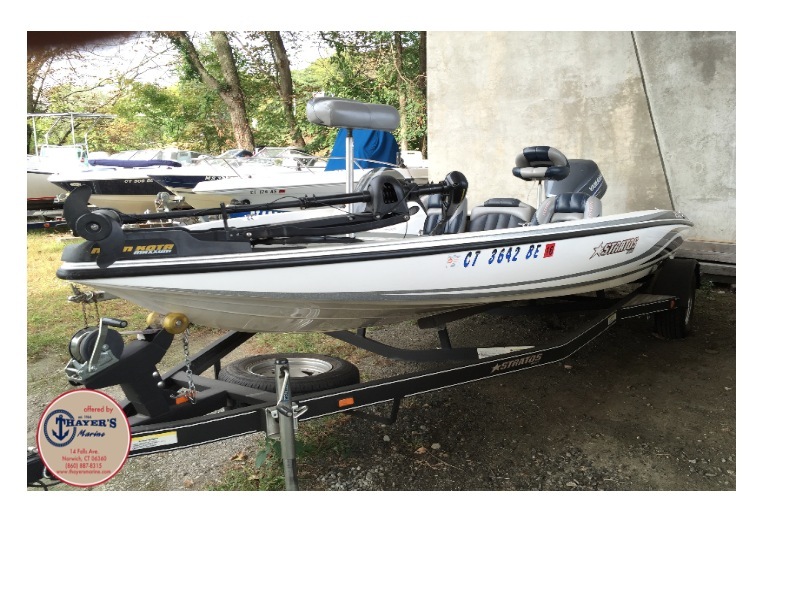 2008 Stratos 275 Pro XL, 2008 Stratos 175 Pro XL - GSN10639G7082007 Yamaha 115HP - 6E5L10197052008 Stratos Trailer - 5K6SB191582080560At Stratos, we believe that you shouldn't have to compromise quality for price. The 275 Pro XL is a testament to that. Imagine a fully-rigged, tournament-ready bass boat at a price thats lower than many aluminum bass rigs. Then imagine yourself in the 275 Pro XL. This 17 footer is more boat for your money than any other bass boat on the market. Due to its enormous 93 inch beam, rough water ride, available storage, and deck space are not an issue. It's hard to believe that you can own a fully-rigged, 100% composite, bass boat that's loaded with standard features for under $17,000, but it's true. Instead of spending your time shopping for a great 17 foot bass boat at a great price, spend your time on the water. We made the choice easy.Please ask about the availability of NO MONEY DOWN FINANCING! 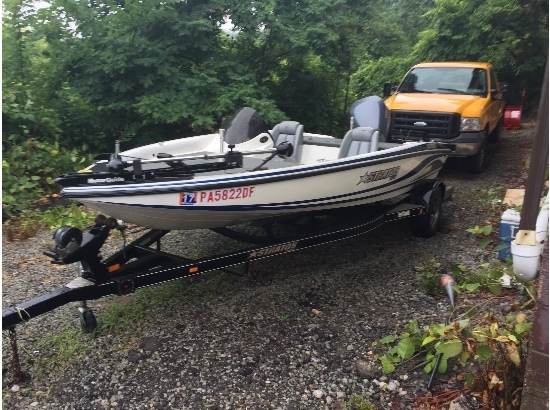 - Specifications - - Material: Fiberglass- Length: 17' 6'- Beam: 93'- Weight w/o Engine: 1450- Maximum HP: 125 HP- Fuel Capacity: 30 Gallons- Transom Height: 21'- Steering: Shaft Mechanical- Capacity - Livewell Storage: 24 gal.Maximum Capacity: 1,200 lbs.Three generations of boating know-how make Thayer's Marine, Inc. your leader for everything boating. With over 100 years of boating experience, we have learned what works, what doesn't, and pioneered what will. Our sales department works to find you the boat of your dreams, our parts department helps get you back on the water, and our service department fixes those problems you cannot, the first time. Oh, and CSI scores in the upper 95 percentile to back it all up.